Hydrogen is the most common element in the universe, yet it is rarely found in its pure state on earth. Instead, it is bound up in compounds such as water or methane (natural gas). It takes energy and a production facility to produce hydrogen from these compounds. Landfill gas: As organic materials decompose in landfills, they emit methane, an even more potent greenhouse gas than carbon dioxide. Capturing that methane before it goes into the atmosphere prevents some amount of global warming. Using that methane as a source of hydrogen for fuel cell vehicles prevents even more climate change. Solar electrolysis: Using clean, renewable, solar electricity (produced onsite) to separate water into hydrogen and oxygen demonstrates the completely renewable potential of fuel cell technology. In fuel cells, the hydrogen and oxygen are recombined, producing electricity for vehicles, and the same amount of water that went into the system in the first place. Beyond powering a fleet of buses, this technology shows one way to store solar or wind-generated electricity for later use. In Emeryville, we have built a state-of-the-art fueling facility that will dispense hydrogen made both from natural gas and from water and solar electricity. 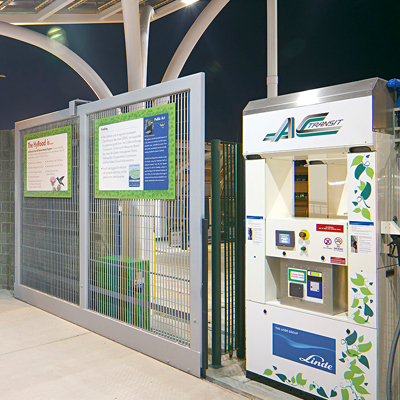 Thanks to a major grant from the California Air Resources Board, a dispenser will be accessible to the public for fueling passenger cars. Overall, this station has the capacity to dispense 600kg of hydrogen per day. In Oakland, we are taking an innovative approach to producing hydrogen, as well as to powering AC Transit’s largest operating division. On March 27, 2013, we installed a 420 kW Bloom Energy stationary fuel cell system. Biogas – collected from landfills – feeds the fuel cell, which in turn supplies clean electricity to the entire facility. Electricity from the stationary fuel cell will also power an electrolyzer to produce carbon-neutral hydrogen for our fuel cell buses. Overall, the Oakland station will have the capacity to dispense 360kg of hydrogen per day, with the capability of increasing capacity by adding additional compressors.